Having co-driven for some years, I’ve had a chance to learn from mistakes of my own, and those of other co-drivers. I’ve presented some tips herein to make your co-driving easier. If you’ve got further questions about co-driving, drop me a line, and I’ll add my answers here. The first tip I can give is about pre-event organization. There is nothing you can do which gives the same return on investment as thorough preparation for the event. To begin, get some 1:50,000 scale maps of the area you will be competing in. In the UK, I recommend the Ordnance Survey LandRanger series, and in the US, I recommend the DeLorme Gazeteer, available for every state. You will need at minimum, two of each map, one for use in the competition vehicle, and one for use by your crew. 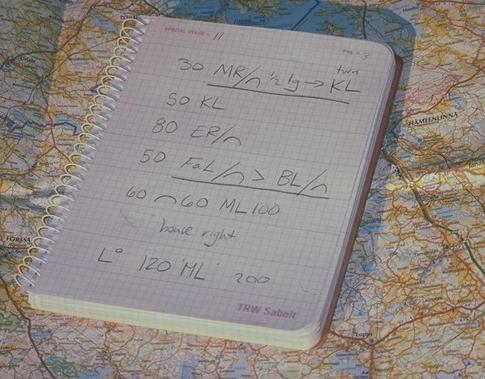 Once you receive your routebook, and have your maps in hand, be sure to mark your maps. Using either a highlighter or pencil, mark the route of each leg, indicating special stages and transits, as well as service locations, fuel stops, and any other points of interest. Also mark the location of the shakedown, the recce route, and any stops for the service vehicles during the recce. On the competitive legs, it can be helpful to mark the approximate times you expect to be at service and major junctions, to coordinate with your crew. Also mark any junctions that are not as they appear on the map with NAM (not as map), and describe them to your service crew. Be sure that your marks are consistent across all copies of the maps. Additionally, if you will be navigating in a city, obtain a detail city street atlas for the city. When you arrive at the event, take notice of any roads that have been made one-way for the event, and mark them on this map. You will find that having these maps will make coordination with the crew a much easier task, and they will provide invaluable should you ever encounter a traffic jam or accident on the way to a time control. On International events, the organizers will generally provide a nice service schedule that you can review with your crew. On national-level events, you’ll generally be on your own when it comes to creating a movement schedule and service schedule for the crews. I generally create a schedule that begins when the first member of the crew leaves home, and ends when the last member of the crew leaves the competition site. It lists every major event and movement required, by both competition vehicle and service vehicles, as well as the service times and durations. It also lists the standard services needed at each service stop, communication details for all parties, and an incident plan. Here is a very simple movement plan I created for a single car, amateur team, running in the US SCCA ProRally series. You should be able to create a plan like this for any event in about 45 minutes. As a co-driver, you’re regularly putting your safety in the hands of another person. Trust your driver, but invest wisely in safety equipment. I’ve been happy with the quality of personal safety equipment I’ve purchased from Sparco and Peltor/Yes. Pencils: Staedler Mars 780 2mm leadholders (4) with 1 dozen 2B leads. These allow for making thick, dark lines on a map or in a pacenote book, and since they’re 2mm, they will not break, no matter what abuse they are subjected to. Eraser/Rubber: Staedler Mars Plastic (2) These are the perfect eraser, able to cleanly erase from a map without damaging the paper or leaving a smudge. Watches: AST CoPilote or Timex Ironman (2). The Copilote has every function that a co-driver could want, but at the price, you can buy 3 Ironmans. If you’re using a Coralba rally computer (especially the C-Giant), a lot of the features of the Co-Pilote are duplicated in the Coralba, and you can save some money on your watch. Pacenote Books: I’ve used both the TRW Sabelt and Pacenote.com books. Both are excellent, and it is a matter of personal choice. I find the Sabelt books a little easier to handle, due to their smaller size, but the spine of the Pacenote.com books is slightly superior. I find the Competitor’s Times notebook from Pacenote.com to be excellent. If you run on a privateer team, get the Team Manager version; you can track more cars on your own that way. Torches/Flashlights: I use a Mini Maglite and an Black Diamond Moonlight LED headlamp. The headlamp is ideal for use when adjusting tire pressures or looking under the hood on a dark night. The Maglite is good for use as a spare should both your co-driving lights go out, or if you have alternator problems. Tire Pressure Gauge: The Bluepoint/Snap-On Dial-Type gauge (stock # YA243A) is sturdy and easy to read, though I've been advised that the innards may be damaged if the gauge is used to lower the pressure on very hot tires. Accordingly, I've now swapped to a Michelin Vigil gauge, which has the added advantage of small size and a dual scale readout. The following equipment is also valuable to keep in your co-driver bag. - Spare key for the rally car and service vehicle. - Large Post-It notes to make service notes on (hand these to crew upon entering service). - Mechanic’s gloves, for changing wheels/tires on stage or transit. - Goggles or protective glasses for both driver and co-driver. - Hat & rainproof jacket. - Spare batteries for all equipment. - Calculator or Palmtop computer. - Rally computer manual or quick-reference sheet. - $200 cash and one credit card. As co-driver, it’s your responsibility to ensure that communication between the competition vehicle and service crew is efficient. You have basically three options for communication: mobile phones, satellite phones, and radio communication. Unless you’re competing on a professional team, satellite phones are usually prohibitively expensive. In Europe, especially the UK and Scandinavia, mobile phones are usually sufficient. Try to get a fairly standard model, like the Nokia 3390, and you can connect it directly to your Peltor intercom. In the US, due to inadequate mobile phone coverage, radio communication is generally required. If you are an amateur team, and both the co-driver and a service crew member are licensed amateur radio operators, amateur radio can be used. With a good 50w system and antenna in both vehicles, range of 50km can be had in flat terrain. If you’re running a professional team, amateur radio use is proscribed by the FCC (US) and RA (UK). In this case, I recommend hiring business band radio equipment for the duration of the event. I hope this has been helpful in furthering your co-driving skills and equipment. I welcome questions, comments, or additions to this list. Please write me at the below address.